The film Arrival asks: If you could see your whole life from start to finish, would you change things? The main question posed in the 2016 sci fi film Arrival is, If you could see your whole life from start to finish, would you change things? When mysterious spacecraft touch down across the globe, Colonel Weber (Forest Whitaker) recruits Dr. Louise Banks (Amy Adams), a renowned linguist, and Dr. Ian Donnelly (Jeremy Renner), a theoretical physicist, to try and communicate with the Aliens and find out why they have landed on Earth. Dr. Banks races against time to decipher their intent. As tensions mount between fearful governments, she discovers the Aliens’ true purpose and, to avert global war, takes a chance that could threaten her life, and quite possibly humanity. This mesmerizing masterpiece has a mind-blowing ending that will leave you wondering what happened and how. That’s the external story, but the essential message of this movie is more internal. It’s about love, determinism and choice. Based on the award-winning science fiction novella, Story of Your Life, by Ted Chiang, it was convincingly transformed into a screenplay by Eric Heisserrer. Having read the book and been moved by it, director Denis Villeneuve wondered how it could be turned into a science fiction film, a genre he had been thinking about for years. When he received the script he decided he finally had to make this film, but with Amy Adams in the lead as Dr. Louise Banks. Even though she was taking a break from filmmaking, after reading the script, she was in. Everyone involved with making the film read the book and loved the story. In the opening scenes we learn that Professor Louise Banks is losing her daughter Hannah to a rare disease. As a child, Hannah asks her mother how she chose her name. Louise tells her she has a special name, because it is a palindrome. It’s spelled and read the same way, forwards and backwards. This is a clue that may help you make sense of certain events in the film that appear as flashbacks. Or are they flashforwards? Yet, in retrospect, it’s not the beginnings and endings that are important to Louise, but how she lived her life, the choice she made to love, regardless of the outcome. Watching this movie was a right-brain experience; it’s non-linear. Dr. Banks goes through changes as she learns the Alien language. Their images communicate ideas in circles without reference to tense or time. Comprehending their language transforms Louise’s brain. She begins to experience the events in her life from a less sequential, more holistic perspective. To love is human. It takes us out of our time, because Love Is Eternal. It always Is. We participate in It. If we are lucky enough. I wrote this as a comment to my son who purchased the film and sent me the link. I couldn’t help turning it into a tanka. You should see this film twice to better understand and appreciate it. Below is the trailer, followed by the Featurette on the DVD Extras. This DVD Featurette gives you a perspective of what went into the making of the film: Arrival (2016) | Behind the Scenes | Understanding Arrival | Full Extras | Full HD. Better to see the film first before seeing these explanations. Nick Statt wrote a great article for The Verge on living with the power of choice: How the short story that inspired Arrival helps us interpret the film’s major twist. ScreenPrism offers an intelligent explanation of the ending of this film. And ChewingSand shares good insights in this video: Why ARRIVAL is Great Sci-Fi. There are more explanations on YouTube. See a fun, informative post-screening SAG-AFTRA Foundation interview: Conversations with Amy Adams and Denis Villeneuve of ARRIVAL. Links to the beautiful Arrival Soundtrack – On The Nature Of Daylight by Max Richter and Jóhann Jóhannsson – Heptapod B [From “Arrival” Soundtrack / Pseudo Video]. Wikipedia gives a comprehensive review/explanation of the film, which might include some spoilers if you haven’t already seen it yet. Also see these favorite romantic films of mine. They reveal the transformational power of love over time. While feeding Sali lunch today I whispered in her ear that she radiates goodness and joy. It is her inner nature. It shows in her smile, no matter what changes she’s going through with the illness. Whether they know it or not, it’s the main reason the staff love Sali. Why I love her. Later in the day, as I was washing my hands, those thoughts came back to me. I composed them in my head as a haiku, then stretched it out to a tanka, and immediately wrote it down. It has a Zen-like quality to it. I also told her about the eternal nature of love, of our love. Circumstances may change—we get old, sick, and die, but that part of us goes on, is eternal. I do believe that love is our essential nature. 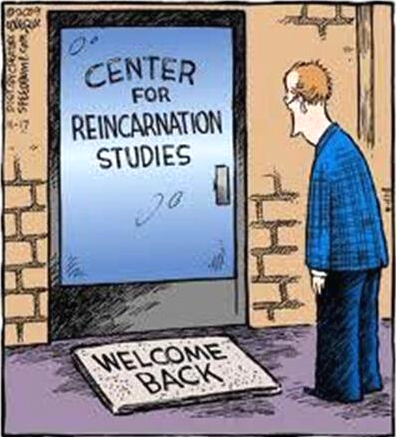 If we reincarnate, come back, we look for it, for that person who radiated it, reflected it back to us, with whom we shared the unifying fulfilling magic of a more enlightening love. The Gita says, Karma is unfathomable, but I add, Love is eternal, and transformational! See Coming Back For Love In Five Favorite Romantic Films, especially the first and last films on the list. See William Stafford—The Way It Is, including the Vedic expression I added. It extends the poem’s theme to its ultimate spiritual conclusion. Her essence shines through the Dementia! Saw this on a friend’s Twitter feed. Too funny to not share. Made my day! 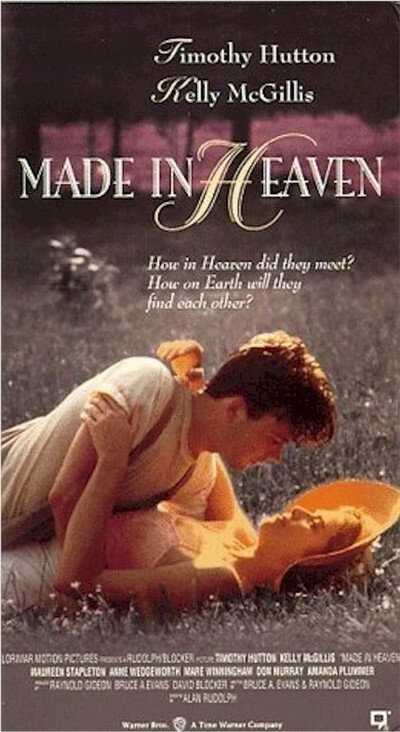 When it comes to getting it right for love, I recommend my all-time favorite romantic movie: Made in Heaven (1987), about two souls, played by Timothy Hutton and Kelly McGillis, who meet and fall in love in Heaven. Annie (McGillis) is sent to Earth and Mike (Hutton) makes a deal to be reborn (Elmo) to find her (Ally). But he’s given a time-frame of 30 years in which to do it, otherwise he’ll lose her forever. It’s a magical movie filled with surprises. Rent it. Read more about it on Wikipedia. Found it on Vimeo with Spanish subtitles. That year, Wim Wenders came out with his amazing film, Wings of Desire, about an angel who tires of overseeing human beings and wishes to become one himself when he falls in love with a mortal. Ten years later it was adapted for English audiences as City of Angels (1998). Wenders co-wrote the screenplay. Nicholas Cage plays the angel who falls in love with a doctor, Meg Ryan, because of her beauty and concern for her patients. She doesn’t believe in angels, but when he reveals himself to her she falls in love with him, and has to decide between him or her fiance. One patient, a former angel, tells him how he became human for a woman. He does the same and experiences the joys and sorrows of love and loss. 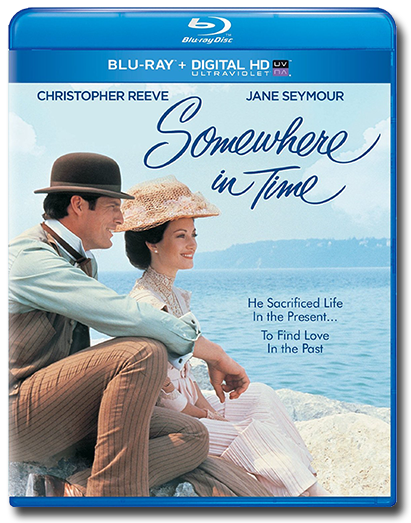 Another great movie is Somewhere in Time (1980) adapted from the 1975 novel Bid Time Return by Richard Matheson who also wrote the screenplay. Richard Collier (Christopher Reeve), a playwright, falls in love with a picture of Elise McKenna (Jane Seymour), an actress who had performed at the Grand Hotel. He discovers he was there and finds a way to travel back in time to win her heart. It works, but something unexpected happens that changes everything. The SAG strike and lack of funds prevented the film from being effectively launched that year. When it was finally shown in New York, critics panned it, squashing plans for a national release. But, with the advent of cable television and late night movies, it soon became a cult classic and went on to win numerous awards. John Barry composed the beautiful soundtrack including the haunting 18th variation of Sergei Rachmaninoff’s Rhapsody on a Theme of Paganini. Barry had been mourning the death of his parents and was not making himself available for work, but Seymour, a close friend, and the script, persuaded him to get involved. He channeled his emotions into the music, which contributed to the film’s success. Visit the official fan website to find out more: http://www.somewhereintime.tv. Another beautiful time-travel love story is The Two Worlds of Jennie Logan, a 1979 made-for-television movie based on the much-loved classic novel Second Sight by David Williams. 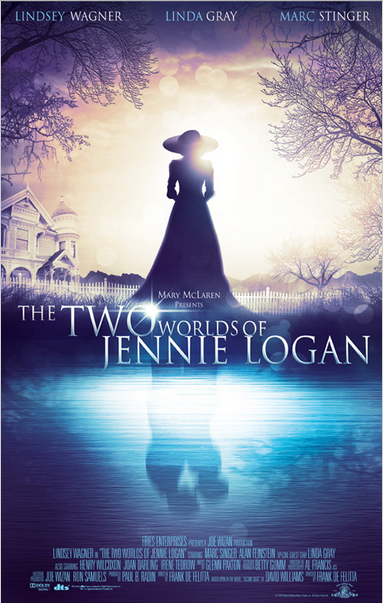 After trying on a dress found in the attic of an old Victorian house her husband purchased to try to save their marriage, Jennie Logan accidentally travels into the past. After several visits there she discovers true love. Returning to the present she investigates who he was and how he may have been killed. She travels between both worlds in an attempt to save her lover’s life and alter history. Find out more at IMDb and the Amazon book description and comments. Watch it on YouTube, if it’s still there. 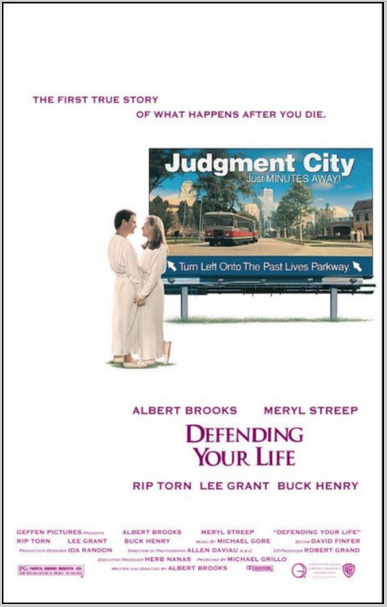 On a lighter note, Albert Brooks wrote, directed and starred, with Meryl Streep, in Defending Your Life (1991), “the first true story of what happens after you die.” The dead are sent to Judgement City, a vacation-style place for the afterlife where representatives using large amounts of their brain potential help you defend your life in front of a court. The opposition also reviews aspects of your life where you showed fear instead of courage, the intent being to learn from past experiences. Blending heaven and earth, the divine and the mortal, the idyllic past with the unfulfilled present, or unresolved issues exposed in the afterlife, each film provides a different perspective on the sacrifice the main character makes for love, giving up one to gain the other. The ways of karma are unfathomable, but true love is eternal, and transformational! There was one movie that made a big impression on me when I saw it on television as a teenager. It’s about love, but more the story of one man’s quest for self-realization in a confused and materialistic world. The Razor’s Edge tells Larry Darrell’s story and his search for meaning after a comrade dies saving his life on the last day of World War One. Larry leaves love behind to find himself. He rejects the conventional life in search of a more transcendent experience, which takes him to India where he meets a guru. His search for enlightenment fulfilled, he may not have to reincarnate if he can walk the razor’s edge, live in the world and not be overtaken by it, anchored to his Self. Larry returns to find his friends who are suffering due to a reversal of fortune brought about by the Great Depression. He shares what he’s learned to help them. Read more of the story on Wikipedia. I saw the original 1946 version starring Tyrone Power, based on the book by W. Somerset Maugham, which I later read. It was remade in 1984 with Bill Murray in his first dramatic role. Murray also co-wrote the screenplay with director John Byrum. Visit Wikipedia for a full summary. Byrum couldn’t find a studio to finance it. 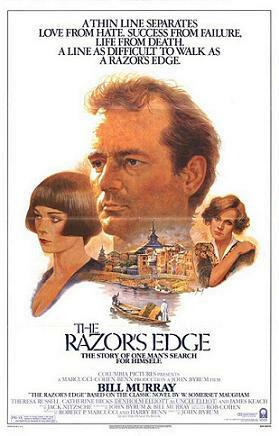 Dan Aykroyd suggested Murray could appear in Ghostbusters for Columbia Pictures in exchange for the studio funding The Razor’s Edge. Murray agreed and a deal was made. Though the film lost money, Ghostbusters went on to make millions. 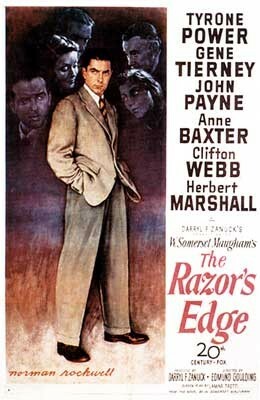 Both versions of The Razor’s Edge are worth watching for their own values, but I prefer the earlier one. You can see the essence of the original film in Darrell’s search and achievement of his peak experience high in the Himalayas. This poem by William Stafford—The Way It Is—perfectly describes the kind of perspective Larry Darrell developed and how he lived his life. To find out more about Maharishi, see this HuffPost article by Philip Goldberg on Maharishi. Also watch the 1968 film of Maharishi at Lake Louise and the 2007 A&E biopic on the History Channel. I just discovered The Love Letter (1998), a Hallmark Hall of Fame movie, starring Campbell Scott and Jennifer Jason Leigh. Based on a short story of the same name by Jack Finney, it was first published in “The Saturday Evening Post” on August 1, 1959, and reprinted in the same magazine on January/February 1988. This love story touches two lives that live a century apart. A letter from the past will change their future forever as these souls cross lifetimes for love! Scott, a 20th century computer games designer, exchanges love letters with Elizabeth Whitcomb, a 19th century poet, through an antique desk that can make letters travel through time. We witness parallel lives interact as they fall deeply in love with each other, weaving past, present, and future in a moving, magical way. You could read more about it on Wikipedia, but first watch this excellent made-for-television movie (1:39:28) on YouTube, if it’s still there. Of course, when it comes to love being tested by time, The Time Traveler’s Wife (2009) is one worth watching. Rachel McAdams stars as the wife, whose husband keeps disappearing on her at different stages of her life. About Time (2013), is another film about time travel, and how a father teaches his son, who has the same ability, how to improve situations with time travel when he messes up trying to win the heart of a pretty woman, also played by Rachel McAdams. She also stars in The Vow (2012), as a woman who wakes up after a car accident with severe memory loss and forgets that she’s married to her husband. He has to work hard to woo and marry her all over again. It reminds me of the 1993 blockbuster Ground Hog Day starring Bill Murray. Here’s a sort of related cartoon in The New Yorker by Roz Chast. When it comes to a war between words and pictures here’s a poem in a movie inviting you to be who you are. The spring rains renew life and the promise of love in this film, A Good Rain Knows, inspired by the poetry of Du Fu. Writing, literature, life and love intersect in The Guernsey Literary and Potato Peel Pie Society. I wrote Our Meditation Love Poem, about 4 ½ years ago, and decided to post it now, for Valentine’s Day. I was visiting my sweetheart during the week at her care facility and wrote the poem and story behind it that Saturday, September 4, 2010, almost 4 ½ months after she moved in. Love so alike, that none doe slacken, none can die. 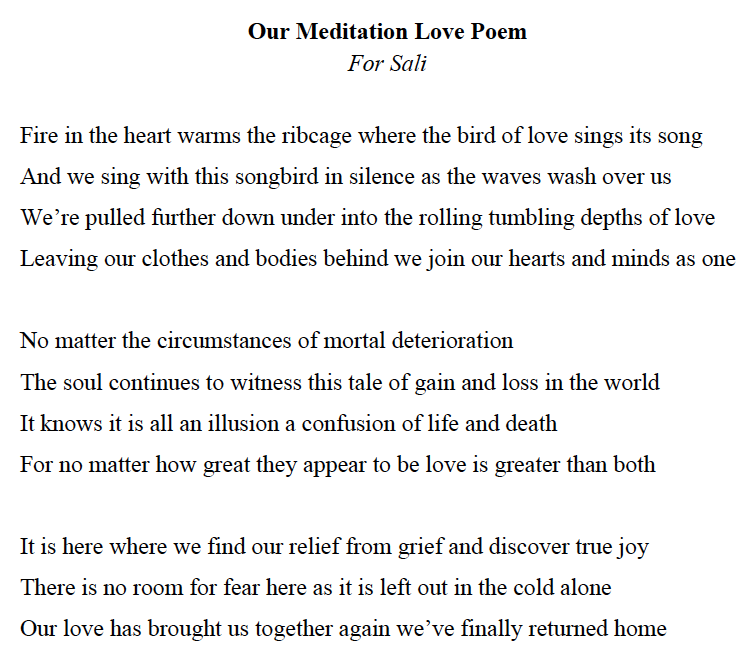 So I came up with this poem, Our Meditation Love Poem. I found myself writing a 17-syllable line, the sum of a haiku in 3 lines. I liked the flow and decided to make each line 17 syllables long, each one having its own internal rhythm and flow. I wanted to write 11 lines for some reason, maybe thinking there were 11 syllables in each line. But now I remember there are 17. But I would then have to write 6 more lines, and right now I can’t see it. I naturally divided them into 2 stanzas of 4 lines each followed by a stanza of 3 at the end. It seems to have worked well. Related: See this #RomanticPoem for #ValentinesDay: i carry your heart with me by e.e. cummings. This Quiet Love, a #LovePoem from Kenny, for Sally on #ValentinesDay. ‘In Our Loving Eyes’ a poem by @kenchawkin remembering a special love with Sally Peden. Enjoy reading other beautiful love poems posted on The Uncarved Blog. I wrote this poem, The Enlightened Heart, in the late 1980s, over 25 years ago. I had begun writing a lot of poetry back then. A few years later, in the early 90’s, I recited it at a World Peace Assembly in Maharishi University’s Golden Dome. I was asked to read two poems that day; the first one was Seeing Is Being. It took a lot of courage to ask to read my poems in front of a few hundred people, but I wanted it to be a birthday present to myself. I was glad to have been invited. The poetry reading produced a wonderful effect within me and the audience. rolling out to a not-too-distant shore. warming under the sun above. Some poems you might like from that earlier era are: Ode To The Artist, and its companion piece Sometimes Poetry Happens. Also see As Above, So Below and a complementary poem, Pine Cone Trees, written several years later while living in Houston, Texas. This poem, Being in Nature, was written after I had returned to Canada to live in Vancouver, British Columbia. After returning to the US, I wrote this poem, Poetry – The Art of the Voice, while living in the Blue Ridge Mountains in Boone, North Carolina. It beautifully expresses the feeling that was created in the dome. You can see more of My poems on The Uncarved Blog. This description of Love reminds me of the nature of the Self described in chapter two of the Gita: It is eternal. It was never born, nor will it ever die. It cannot be destroyed when the body is destroyed. When it comes to mystical conception and creative inspiration, Love is expressed in a beautiful poem by New York poet laureate Marie Howe. Listen to her read Annunciation to Krista Tippett On Being. For another Vedic perspective from America’s greatest poet, see Emily Dickinson’s Solitude, where she describes the self-referral process of the self integrating with the Self, finite infinity. Read how Emily Dickinson wanted her poems to look on the page, described in Rebecca Mead’s Back of the Envelope in The New Yorker: Poesy Dept. | January 27, 2014 Issue. Here is another cosmic love poem by another one of America’s greatest poets: i carry your heart with me by e.e. cummings. See A Blessing of Solitude by John O’Donohue, from Anam Cara: A Book of Celtic Wisdom, which profoundly complements Derek Walcott’s poem Love After Love.